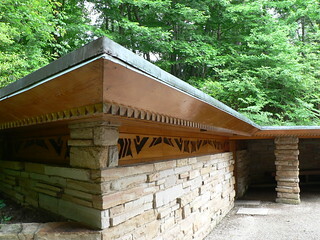 In the early 1950s Bernardine and I N Hagan asked Frank Lloyd Wright to design a house for them on their land in the mountains above Uniontown in Pennsylvania. 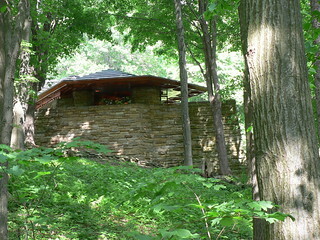 Lloyd Wright obliged and without visiting the site, except for a short trip during the construction phase, he produced a wonderful house. 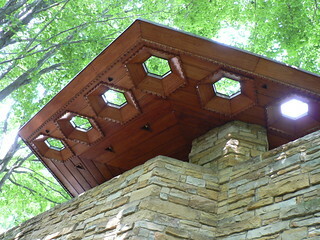 Here's a few photos of the the I N Hagan House when I visited Kentuck Knob in 2005. 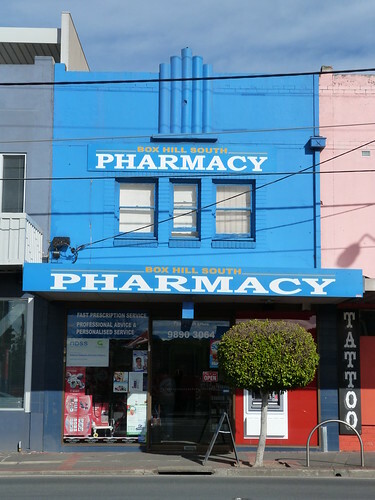 Driving through Box Hill there other day I came across this great group of deco shops. 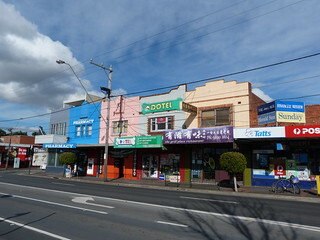 I'm not thrilled with the current colours but the different decoration on each shop is interesting. 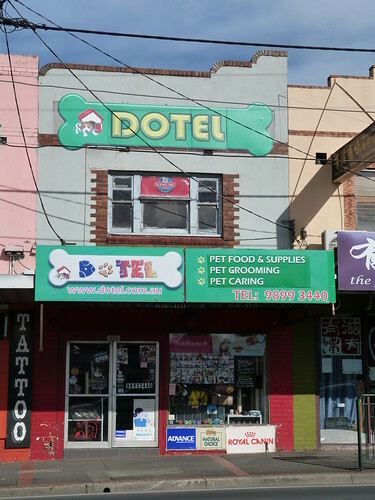 I love the roofline on DOTEL particularily. 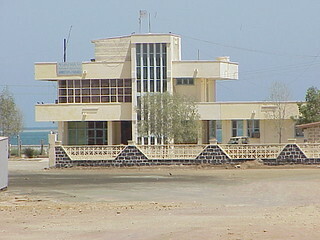 I think this is a little gatehouse at the port in Massawa. 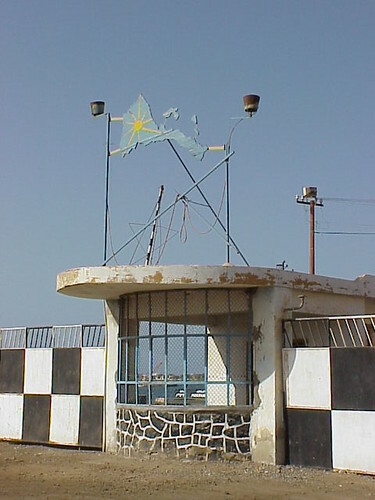 It has the outline of Eritrea of the roof left over from the celebrations for the anniversary of their independence a few weeks earlier. 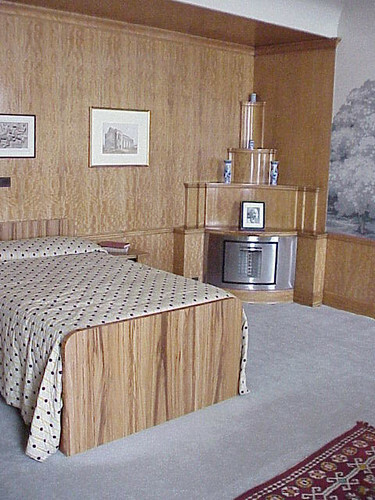 And I do love black & white checks but that's not a deco thing. 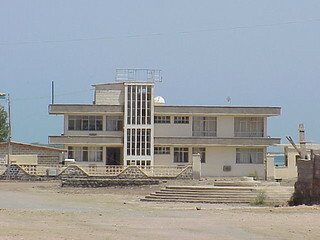 I remember it was bloody hot the day we were in Massawa. 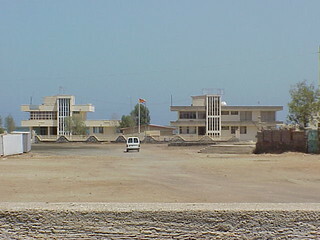 Too hot for a lot of walking so this is as close as I got to this pair of buildings. The zoom brought them a bit closer! 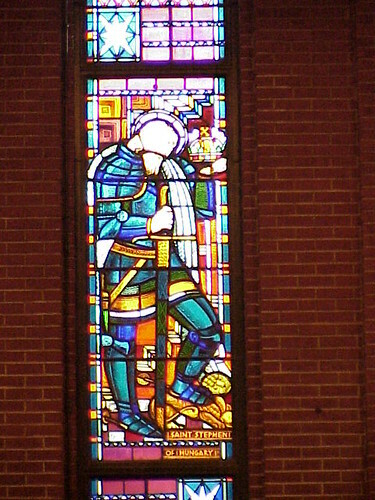 I don't know what it was originally. 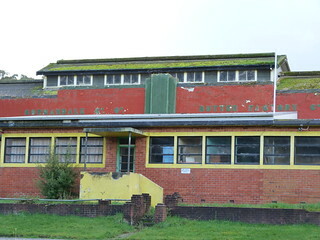 Some sort of workshop or factory perhaps. 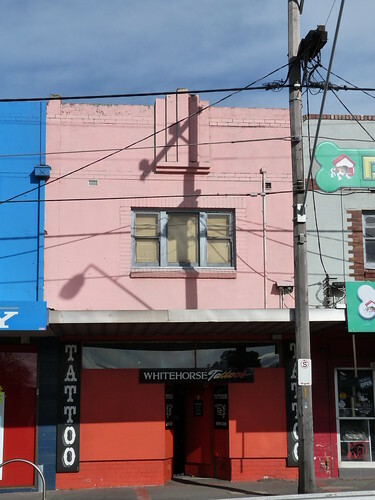 The sign on the façade indicates that the most recent use of the building was for the West Gippsland Vehicle Restorers Club. 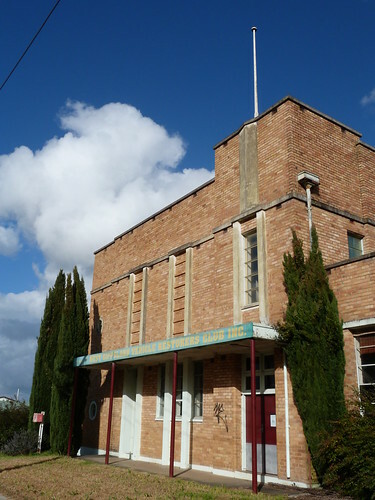 I have used the past tense because although the building seemed to be in a good state of repair and the club's name was clear and easy to read there was a notice on the door saying that the club's 9th July meeting would be (was) held at the club's new rooms in another part of Warragul. 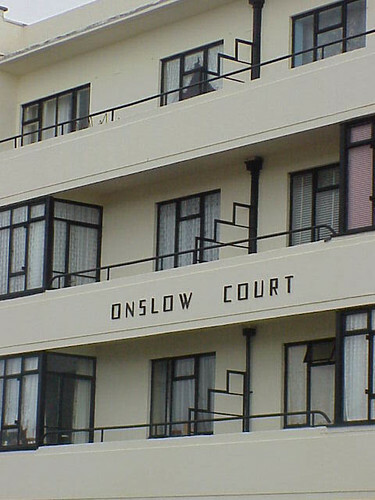 There was no year on the notice so I don't know if this is a recent development or not. 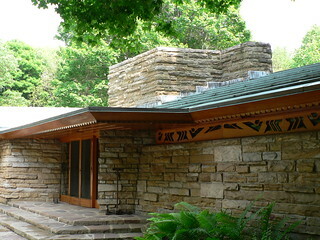 In any case it is a wonderful building with simple decoration. 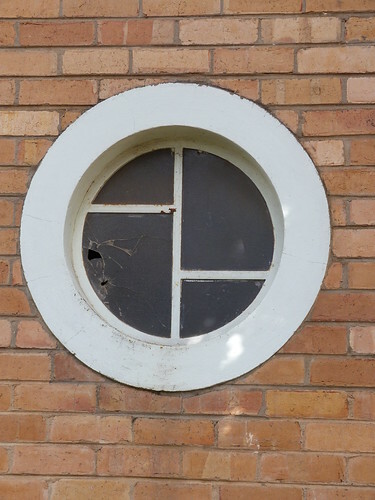 A peaked concrete panel directly below the flagpole and porthole windows divided into an interesting geometric pattern. 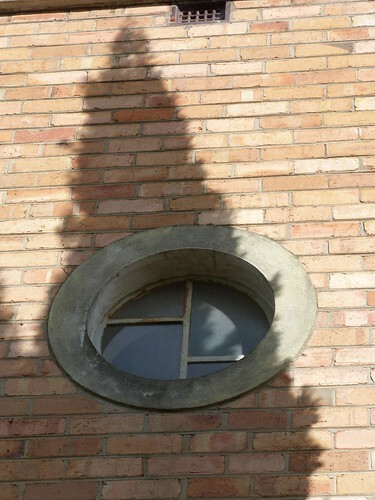 And I did like the shadow play on the higher of the two portholes. 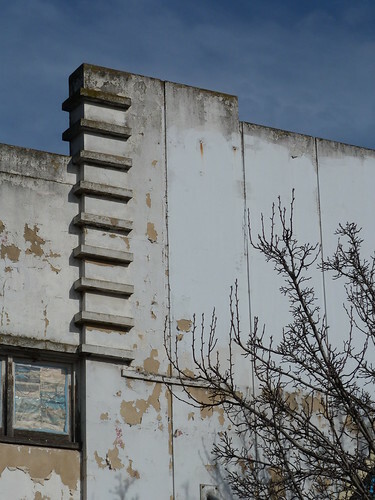 In deco style, even the side of the building looks good. 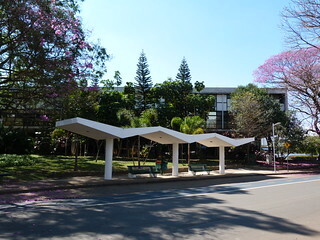 A great modernist bus shelter in Ibirapuera Park, São Paulo. 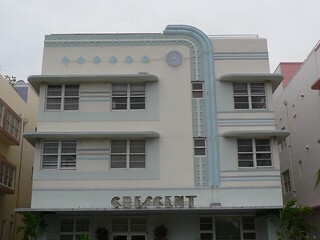 The Crescent Hotel on in Miami South Beach. 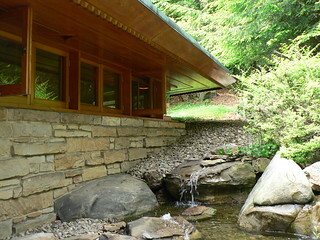 Another masterpiece by Henry Hohauser built in 1938. 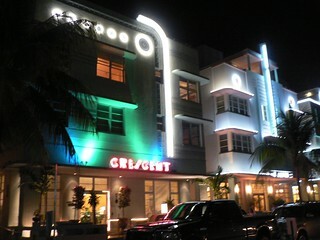 And like all the hotels along Ocean Drive looks even better at night. 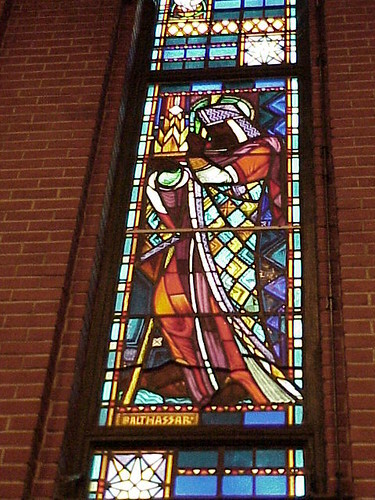 I've written about Christ the King Church (1928) in Tulsa previously but I didn't include any photos of the stained glass windows by Alfonso Iannelli. 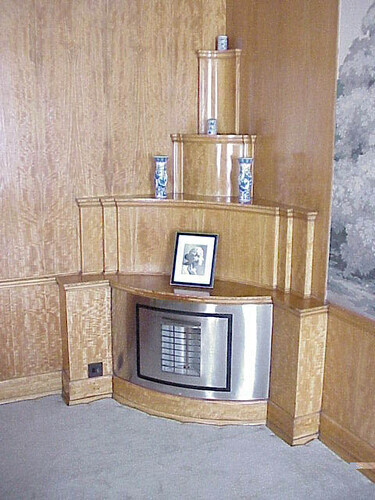 Pure and simple. 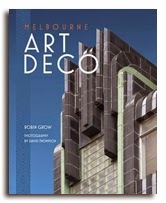 A fabulous piece of deco eye candy. 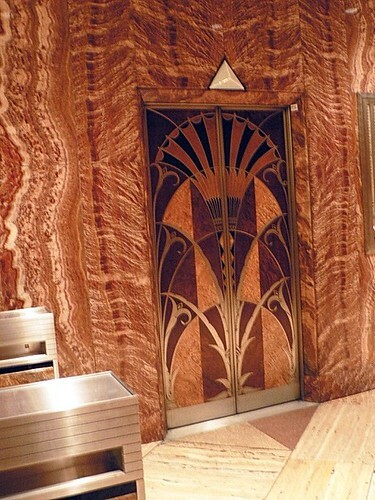 A lift door in the foyer of the Chrysler Building in New York City. 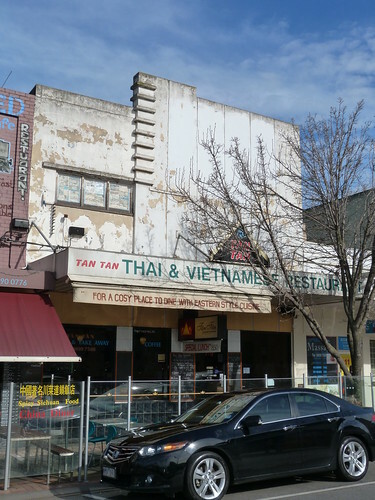 A lick of paint and Tan Tan Thai & Vietnamese Restaurant in Box Hill would look sensational. 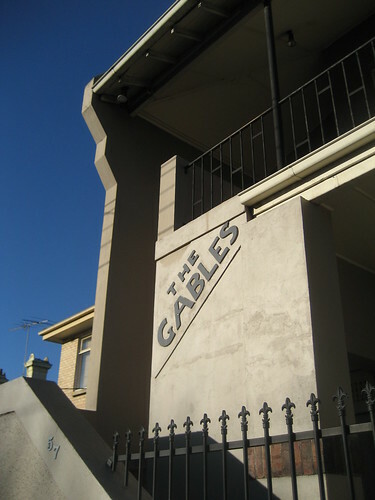 This fabulous building in Carlisle Street, Balaclava is a former branch of the Commonwealth Bank of Australia. 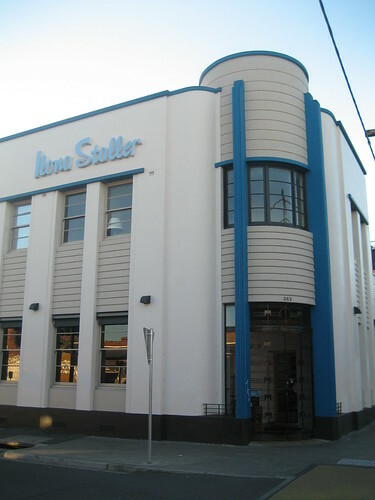 I remember it in recent times as a take-away chicken joint but last year it was remodelled as a restaurant/bar, Ilona Staller, by Grant Amon Architects bringing a contemporary Art Deco interpretation to the old Art Deco bank. 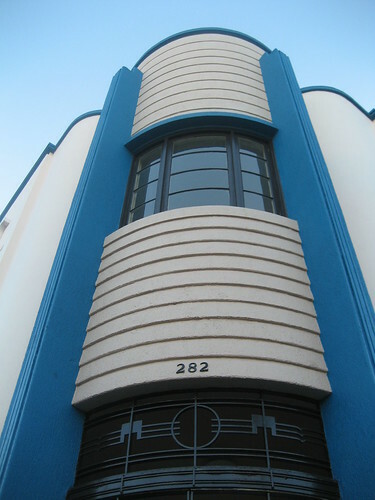 What do we think of these flats in St Kilda? 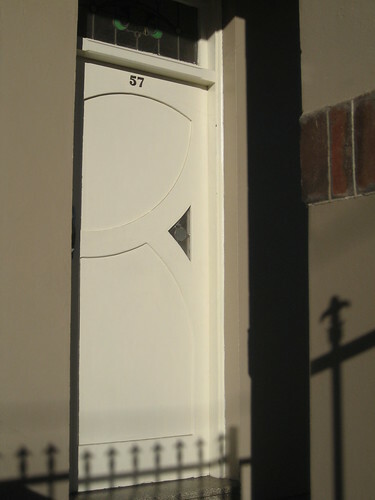 and a fabulous deco door. 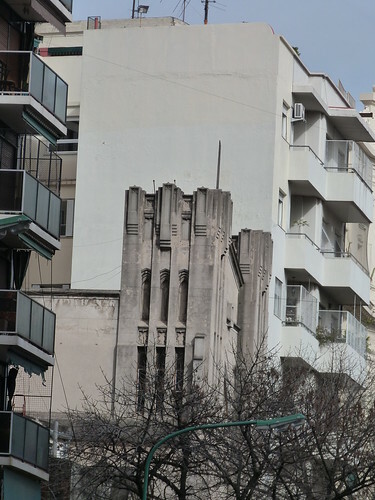 As we walked down Avenida Rivadavia in the Argentine capital of Buenos Aires this was the first inkling that there was an interesting building ahead. 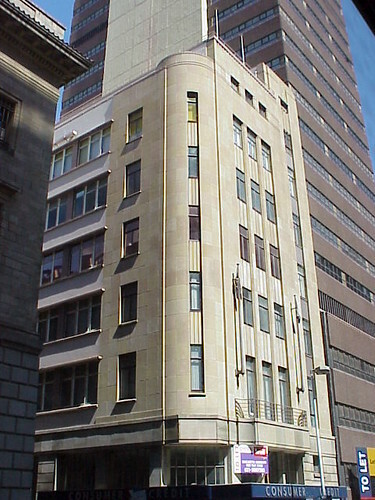 Or should I say another interesting building because BA is chock-a-block with interesting buildings especially from the Art Nouveau and Art Deco eras. 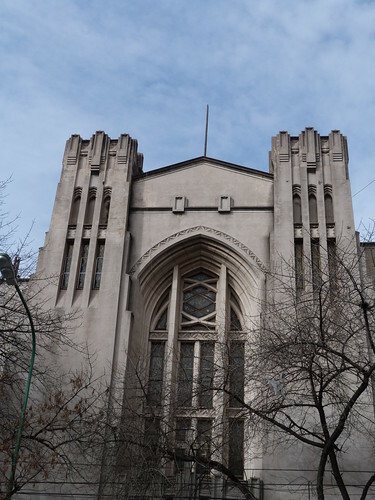 As we drew level, we could see it was a church, the Templo Metodista as it turns out. 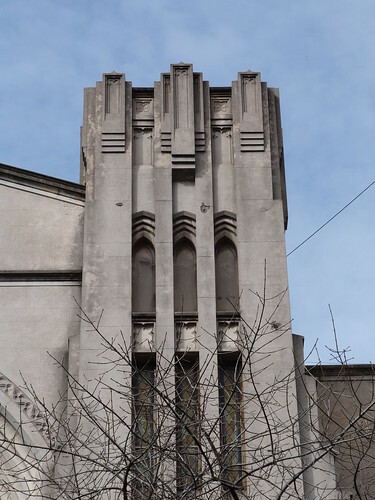 The church dates from around 1930 and was designed by Phillip Massey. 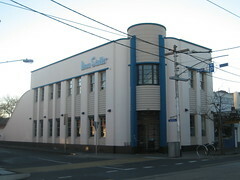 I took this photo of the The Tivoli in Christchurch in September 2006. 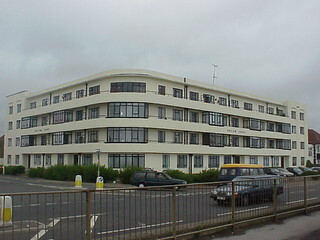 It doesn't look the best, especially at ground level and in fact it was demolished in 2007. 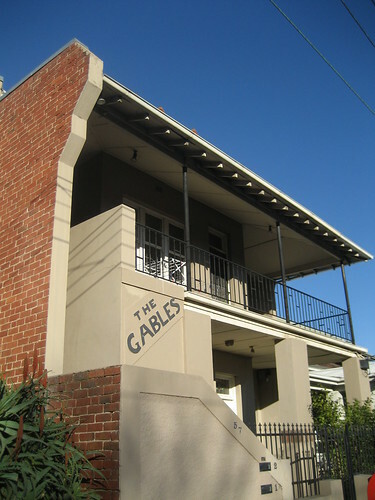 In 1915 Everbody's Theatre opened on this site in Cathedral Square. 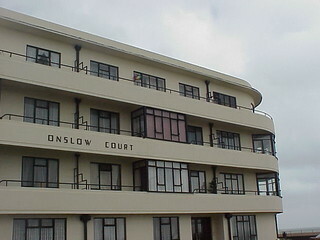 It was remodelled in Art Deco style in 1934 by Cecil Wood with input from Paul Pascoe. 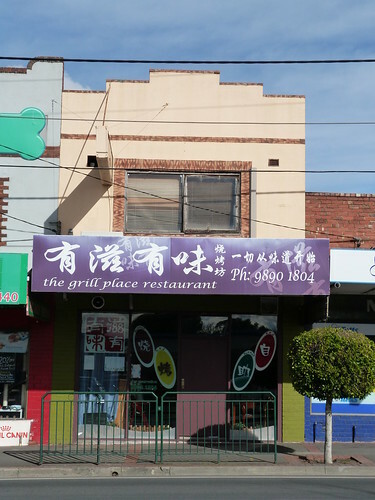 This is when it took on the Tivoli name. 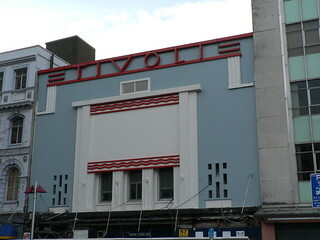 From the 1970s it was known as the Westend Theatre but the Tivoli name remained intact under alterations dating from that time but it remerged after some TLC to shine brightly for the final few years of the old theatre's life. 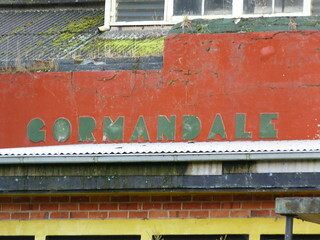 Yesterday we when in search of a factory we had heard about in Gormandale. 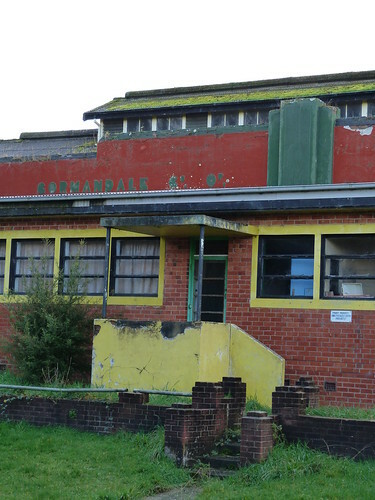 As we approached the village there was no doubt that the old Gormandale Co-Op Butter Factory Co Ltd was the building we had heard about. It was raining but I jumped out and started taking photos quickly attracting the attention of the owner. 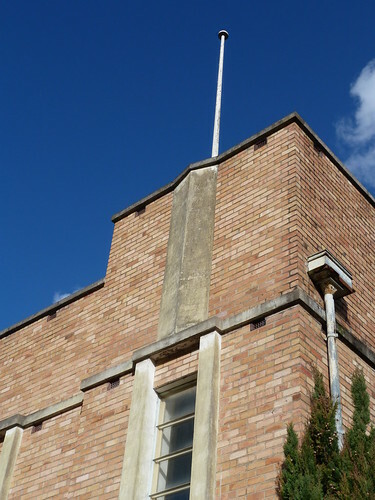 He told us that the factory had been built in 1947 and was the first fully automated butter factory in Australia. 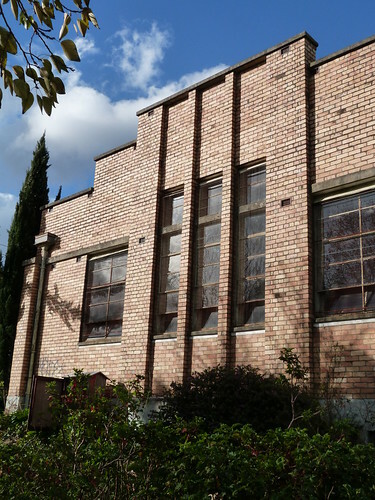 A quick scan of the many references on the National Library of Australia Trove site to a butter factory in Gormandale indicate that the Crossover Butter Factory was established at Gormandale in the early 1890s and there at least one new butter factories built prior to this one. 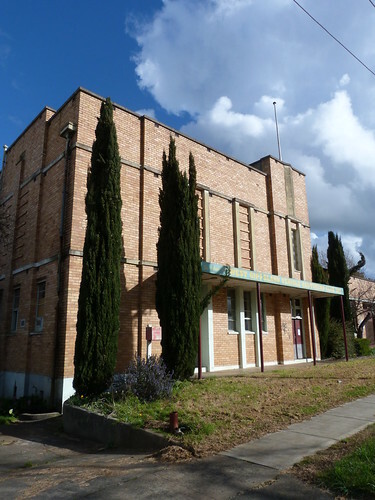 A list of auctions by Gippsland & Northern Co-Op Co Ltd in The Argus newspaper of 19 Apr 1950 lists 'Gormandale Butter Factory Co. Unused butter factory for removal, large brick & W.B. 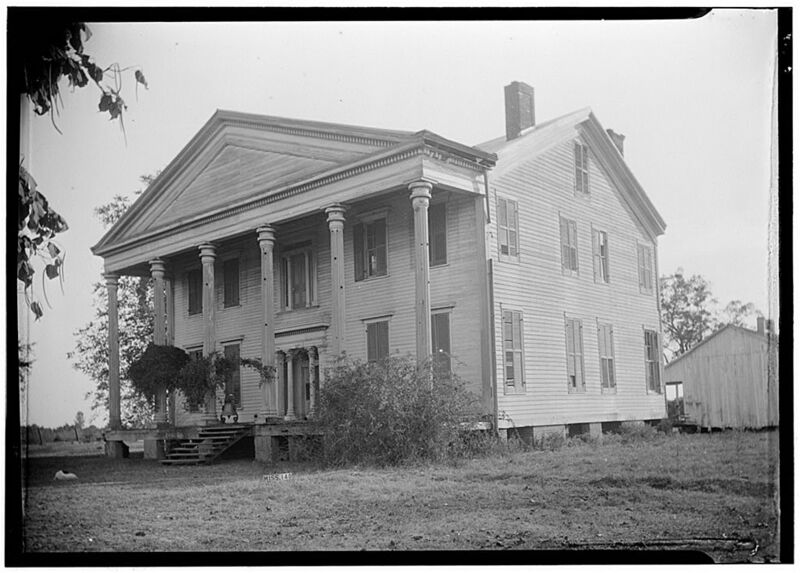 bldg., iron roof, quantity water piping, sheds, and sundry plant.' 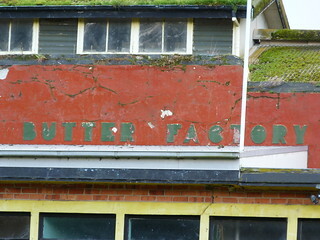 seemingly confirms that a new factory was constructed in the late 1940s. 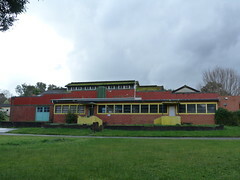 The buildings are listed by the National Trust as "... a visible reminder of the importance of the dairy industry in small-town Gippsland.'. 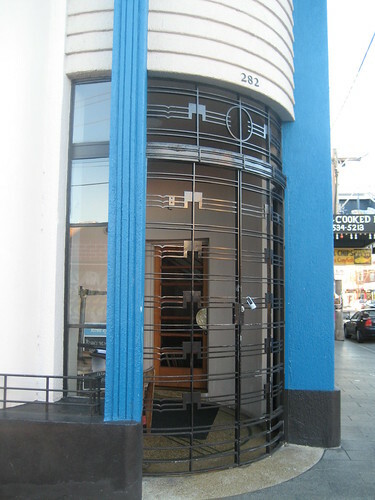 The owner showed us around inside but there wasn't really any deco features left and he told us the butter factory had closed in the mid 1970s. As we were leaving the owner, who uses the building as a workshop gave us a lovely souvenir. 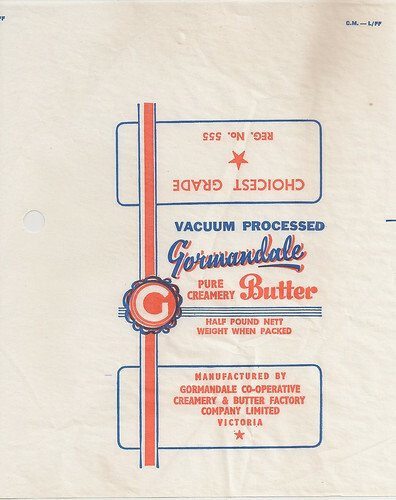 A unused Gormandale Pure Creamery Butter wrapper!